We have a large selection of CDs, DVDs, books and watercolours for sale. 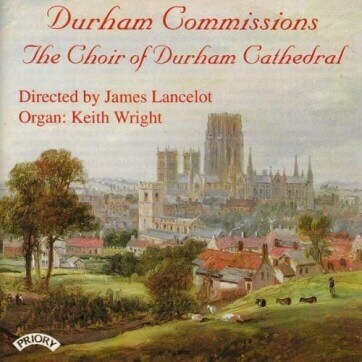 The proceeds from the sales of these items goes towards the work of DCCA in supporting music at Durham Cathedral. Please click on a thumbnail image for further details including audio samples of the CDs and DVDs. Or visit the Cathedral Shop where many of DCCA's items are for sale. 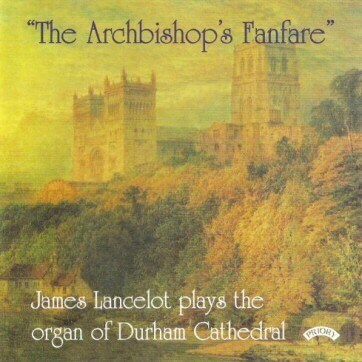 This was James Lancelot’s farewell CD from Durham Cathedral where he was Master of the Music for over 30 years, making a large number of highly acclaimed recordings for Priory. 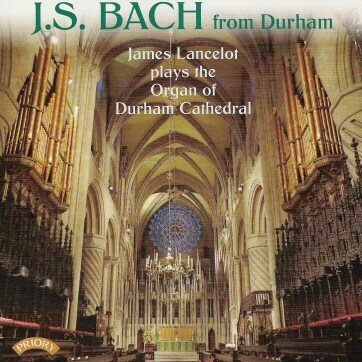 “Bach from Durham” will be the first of a short series of CDs to showcase the versatility of his music on cathedral organs within the UK. This idea has never been presented before. A mixed collection of works features in Lancelot’s recital and shows off this cathedral organ in a splendid light. This is the first commercial recording of this little known organ. In choosing repertoire, the objective was to showcase the diversity of the instrument’s resources. The original Snetzler stops feature largely in the 18th century repertoire whilst the remainder highlights the more recent additions to the specification, and the versatility of the organ as a whole. The hymn tune bearing the name Kings Lynn is featured, as is music by two of the Minster’s former organists – John Jordan and Charles Burney. 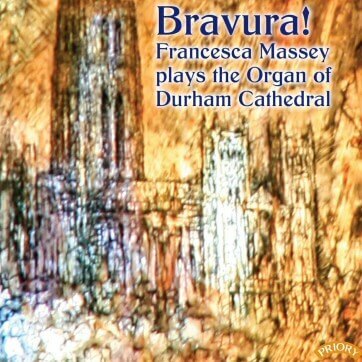 Francesca Massey is the assistant organist at Durham cathedral and this is her second CD for Priory. 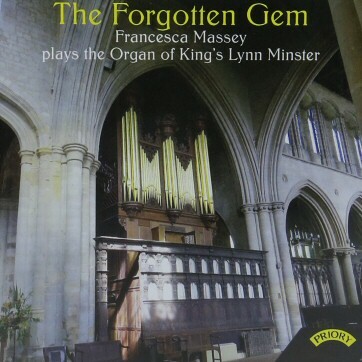 "....the Kings Lynn organ has much to recommend it and the 18 page booklet notes are a model of their kind and an illuminating read alongside her repertoire notes. Vivid recorded sound too." "Massey's playing of the early repertoire is particularly engaging however she is equally at home in the 20th century literature. This instrument is well worth hearing and this disc admirably reflects its quality and versatility." Martin Clarke - (Five stars) - Editors Choice - Organist Review. We shall never know why Bach planned the Orgelbüchlein to contain 164 chorale preludes, but composed only 45. Does the collection we have represent simply all he had time to compose; or did Bach, realising that the remaining 119 chorales would never see the light of day, nevertheless seek to give logic and coherence to what remained? I incline to the latter theory; the collection takes us chronologically through the Church’s year from Advent to Pentecost, with the remaining twelve chorales being non-seasonal but relating to particular needs or occasions - before the sermon, for the dying, and so on. And it is pure coincidence that what is surely the greatest setting occupies centre place in the collection? Twenty-two chorales precede and twenty-to more follow the towering masterpiece that is O Mensch, bewein. In the title-page of the collection Bach lists his aims: to instruct a beginner at the organ how to work out a chorale in many different , and to achieve perfection in playing the pedals, whose use in these chorales is wholly obligatory. Bach being the composer he was, what could have been dry-as-dust material is in fact music so varied and beautiful that it has become the organist’s Bible. Others have written eloquently and at length of the construction, symbolism and dating of the chorales; suffice it to say that Bach’s invention seems endless, to the extent that it is hard to think of any chorale that reminds one of any other, such is the variety Bach achieves in what are for the most part in one sense no more than decorated harmonised play-throughs of the chorale melody ( to reduce matters rather unkindly to their bare essentials). The majority of the preludes are composed in four-part texture - one part in the pedals and three in the manuals. All use the pedals - three of them in the tenor, otherwise in the bass. All employ distinctive and unique rhythmic or melodic figuration in the accompanying parts - sometimes shared with the pedals, sometimes with separate pedal ostinati - sometimes derived from the chorale melody, often independent. Endings are often characterised, and slowed down, by thickening of the texture, by false relations between the parts, or by chromaticisms. With the exception of In dir ist Freude, the chorale melodies are presented continuously with no breaks (or almost no breaks) between the phrases. I suggested the the Orgelbüchlein had become as it were the organist’s Bible. No organist should be ignorant of the collection; every organist should master some at least of these chorales, which have adorned the liturgy of churches throughout and far beyond Lutheran communities. It was John Dykes Bower’s playing of these works in St Paul’s Cathedral that introduced them to me in my Chorister days; and on being elected to the Organ Scholarship at King’s College, Cambridge my first step was to learn all those preludes that were not already in my repertoire. These pieces have been lifelong companions, and in recording them forty-five years later I pass a milestone on what is a personal pilgrimage, an (I hope) go some way towards repaying the rewards they continue to give me. No organ with Romantic voicing, electric blowing, elctro-pneumatic action and (not least) a scale tuned in twelve equal semitones is going to make the sort of sound that Bach would have recognised in his lifetime. So why record this music in Durham Cathedral with its Willis/Harrison instrument, built in 1877 and subsequently rebuilt three times? Fisrtly, because Bach’s music transcends its medium; it is less insolubly tied to specific tone-colours than (for instance) French Classical organ music. But second, perhaps, because the organ at Durham possesses sufficient variety and vitality to bring each piece convincingly to life. I have not repeated any registration; every plenum is different. Wether or not my confidence is justified you, the listener, must decide. The pieces featured on this recording comprise twentieth-century works from Britain, France and Scandinavia, which show immense variety in terms of their musical language, structure and use of the organ. There are common threads linking a number of the works: the use or creation of hymn tunes, folk melodies or chorales, and the inspiration taken from their texts or country of origin. Another theme is the concept of earthly struggle, giving praise to God, and the striving for ultimate redemption in heaven. 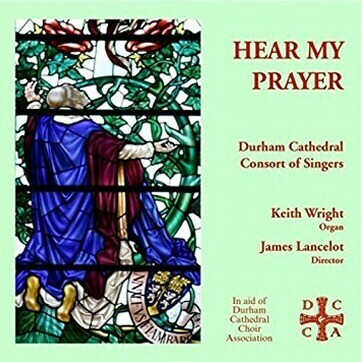 I am immensely grateful to Durham Cathedral Choir Association and Priory Records for their instigation and production of this recording-project. I am equally indebted to my colleagues and former teachers, Francis Pott, and to my family, for their support, guidance, and help in preparing both music and programme notes. York Bowen was a highly-successful and well-respected musician during his lifetime, producing a vast catalogue of compositions, most of which sadly remained unpublished or underperformed following his death. One explanation for this can be attributed to the fact that his compositional style remained firmly rooted in Romanticism, which had largely become unfashionable by the 1960s. Dubbed the ‘English Rachmaninov’, his compositions are laden with luscious chromatic harmonies and rich textures, encompassing expansive sweeps of phrasing. A much-acclaimed concert pianist, most of his best-known works are for orchestra or piano, including four piano concerti, which he himself premiered as soloist, appearing at the BBC Proms under Sir Henry J. Wood. Pianistic textures are much in evidence in his majestic Fantasia for organ, dedicated to the eminent organist Arnold Richardson. Framed by a march-like theme, the work is immediately arresting and impassioned, yet there are also moments of great delicacy and tenderness, allowing for full and colourful use of the organ’s resources. Diptyque is one of Olivier Messiaen’s earliest organ works, composed in 1930 during his final year of studies with Marcel Dupré and Paul Dukas (to whom the works is dedicated). The work’s subtitle (essay on earthly life and blessed eternity) is portrayed through two vastly-contrasting sections, in which not only do we witness the early development of Messiaen as a composer, but also the heartfelt expression of his own profound Christian faith. The first part of the work is largely influenced by the style of Dupré; highly-chromatic yet diatonic, and densely-textured with a great sense of rhythmic drive and crispness of articulation. The resulting complexity of the music signifies the unrelenting pace and futility of the struggle of our earthly existence. The music reaches a height of anguish in a dense passage set in canon, after which the tension rapidly dissipates, making way for the work’s exceedingly calm second section. Here we see the early manifestation of Messiaen’s innovations in the treatment of harmony, rhythm and tempo, which were to characterize his unique style. The timelessness of eternity is portrayed by an extraordinarily slow, almost static, harmonic rhythm, whilst an exquisite, transcendental melody slowly climbs to the very top of the organ’s compass, representing tha ascent of man towards God. Ten years after composing the Diptyque, Messiaen transcribed its latter section for violin and piano under the title Louange à l’immortalité de Jésus, which became the final movement of the poignant Quatuor pour la fin du temps (Quartet for the end of time), written and first performed during his imprisonment in a German prisoner-of-war camp. Oskar Lindberg was a prominent Swedish composer, organist and teacher. An avid collector of folk melodies, he was also editor of the Church of Sweden’s Hymnbook, to which he contributed a number of new hymn tunes. His music largely encompasses a Romantic idiom, with overtones of Rachmaninov and Sibelius, as well as the French Impressionists. Above all, however , his music is essentially Nationalistic, drawing on the folk melodies of his beloved Sweden, and the beautiful landscapes of Dalarna and Lakeland, where he grew up, and where he often composed during summer months. Dedicated to his compatriot, the organist Albert Lindström, who died in 1935, the four-movement Sonata in G minor begins with a grand Funeral March, which hints at the echoes of a passing marching band. A delicate, almost wraithlike Adagio, and an equally mysterious Sarabande follow. The gloom is lifted in a joyous Finale whose main theme is imbued with infectious dotted rhythms. The second thematic subject is more hymn-like: subdued at its first appearance, it returns in a triumphant and symphonic rendition which brings the Sonata to a resplendent conclusion. Marcel Dupré enjoyed a varied and glittering career as a teacher (for thirty years as Professor of Organ and later Director at the Paris Conservatoire), a virtuoso organist (giving recitals worldwide and succeeding Charles-Marie Widor as organist at the Parisian church of Saint-Sulpice), and as a highly-regarded composer. In 1914 he was awarded the prestigious Premier Grand Prix de Rome; however, the outbreak of war meant he was unable to take up the prize of a period of residence at the French Institute in Rome, the Villa Medici. Among the compositions dating from that time are the Three Preludes and Fugues, which include the melancholic Prelude and Fugue in F minor, dedicated to the memory of Augustin Barié; a former organist at Saint-Germain des Prés, who died young in 1915. The Prelude sets a pensive melody against a persistent pendulum, reminiscent of the gentle pitter-patter of raindrops. The introspective Fugue (never extending beyond 8-foot timbres) is derived from the same upwards, yearning melody; the enduring presence of which can be heard as a continual striving for release. Whereas most fugues gather momentum towards their ultimate goal, Dupré chooses a more elusive path. Despite fleeting rays of sunshine, the piece has a rather tragic ending, falling away as if emotionally spent. William Mathias was the foremost Welsh composer of the twentieth century. A pupil of Lennox Berkeley at the Royal Academy of Music where he later became a Fellow, he was Head of Music at the University of Wales, Bangor, and founder of the North Wales International Music Festival. He composed his Variations on a Hymn Tune (based on the traditional Welsh tune Braint) in 1962, as a commission for BBC Wales; receiving its first performance in Llandaff Cathedral by Robert Joyce. One of his most substantial organ works, it begins with a regal introduction, before the theme is presented modestly by two flutes in canon. Six extremely-varied and characterful variations follow, exploring the modality and lyrical beauty of the tune, alongside the resoluteness and rhythmic vivacity of Mathias’s own distinctive musical language. A kaleidoscopic array of timbres is showcased, from the quietest string stops to the loudest of tubas, through a series of dances, marches, elegies and fanfares. Composed in April 1934, Jehan Alain’s Choral Cistercien belongs to the plethora of ingenious and highly-original works produced during his short compositional career, ending in his tragic death in combat at the age of just 29. This serene and ethereal miniature was designed for the offering up of the host at Mass. The dovetailing of the two hands and lack of pedal sonority leads to a feeling of awe and mystery; one can almost visualize the cloud of incense as the delicate sonorities gently drift around. Only discovered posthumously, the Choral was written during one of his stays at the twelfth-century Cistercian Abbey at Valloires, in the Somme, a place where he sought peace and refuge from the busyness of daily life. The sparkling Toccata on ‘Nu la oss takke Gud’ (‘Now thank we all our God’) is perhaps Egil Hovland’s best-known organ work. An extremely-popular and prolific composer of instrumental, choral and orchestral works, Hovland was organist and choir-master in Fredrikstad, Norway, from 1949 until his death in 2013, becoming a Knight of the Royal Order of Saint Olav in 1983 in recognition of his services to Norwegian music. His teachers included Aaron Copland and Luigi Dallapiccola; his own works displaying an assortment of compositional styles. Composed in 1973, the Toccata is saturated with exuberant bell-like cascades, with the chorale melody proclaimed successively in both the right hand and the pedals. A triumphant homophonic statement of the chorale allows for some colourful harmonic reworking, before a jubilant conclusion is reached in a blaze of rising cluster chords. ‘The impulse to write this piece came from the experience of sitting beneath the famous Octagon in the crossing of Ely Cathedral during a performance of the Berlioz Requiem Mass. Architectural features of our great churches communicate as deliberate visual metaphors for things of the spirit; and so, on a summer evening, with shafts of light intersecting in its lantern, the Octagon provided a memorable image of Christian aspiration willing the soul upward, away from the earth and towards heaven. This is the idea behind the the resulting music. This recording is a personal collection, selected by the composer, representing a number of favourite compositions, many of which have never before been recorded. The list of the music’s dedicatees is personal too; mentors and teachers, former musical colleagues and choirs, and family. Those lucky enough to have sung under Richard Lloyd's direction grew up on a healthy diet of the best of centuries of church music stretching back to Tallis and Byrd, through Wesley, Wood and Stanford to Bairstow, Darke, and of course Herbert Howells. And how could these great influences not seep through into the music of a composer who has spent his life immersed in the music of the church? Richard Lloyd’s music is a joy to perform and a delight to hear. It enhances the worshipper’s experience in being ‘accessible’ to all. His skill is to make what may appear on the page as tonally or rhythmically challenging sound effortless to the ear. During the recording sessions with The Bede Singers - a group especially assembled for this project - spontaneous applause broke out at the end of some pieces, and a buzz of something special surrounded others. It is hard to single out individual items, but the ethereal All so still stands out as having being unjustly neglected in the 40+ years since its composition. Richard Lloyd has en eye for the fine texts which offer much to the creative mind, and here is one such gem. A Song of the Passion is another hidden treasure, unperformed since its composition in 1985. The music cascades downwards, like the tears in the text, supporting a beautiful beseeching dialogue between tenor and soprano solo. Melody is always key, underpinned by rich harmony. Vocal scoring is assured - use of divisi, chord spacing and musical ‘grammar’ all add subtly to the polished final result. Humour is evident in the scores, with a penchant for more obscure musical directions (stinguendo, zelosamente, vezzoso, and the oft-used tempo comodo). The is always great warmth in the music; chords are coloured at every opportunity by added notes and suspensions. Joy and optimism are always present, even when the text may not suggest it. The composer's strong faith underpins everything. “Music from the heart, to the heart” is how Ian Shaw memorably described the music of Richard Lloyd. This collection, spanning a truly impressive 60 years of compositions, perfectly illustrates that notion. The music is heartfelt in its conception and its creation. It touches the hearts of those who perform and those who listen. The Palatinate Ensemble has, for many years, accompanied the Cathedral Choir at services as well as performing with the Choir and Consort in high profile events including the Sage Gateshead Concert in 2009. In addition, the Ensemble has performed a number of its own concerts; recordings of two of these, in aid of the DCCA, are available. 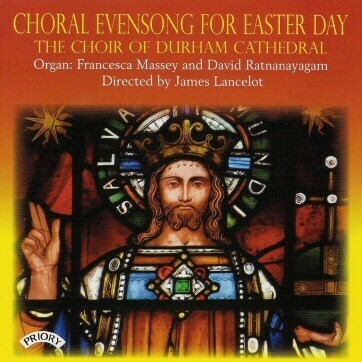 This recording presents the Office of Evensong as it might be offered in Durham Cathedral on Easter Day. 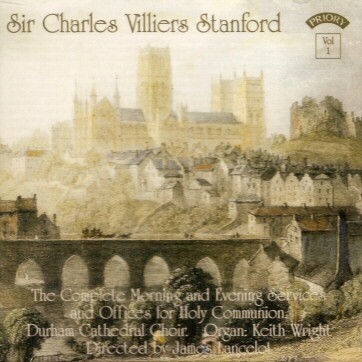 Conrad Eden’s Ceremonial Responses for Easter (normally sung from the west end of the cathedral, and a much-loved feature of Easter at Durham) begin the Office after the opening voluntary; the Preces and Responses are those composed by Francis Jackson for the West Riding Cathedrals Festival, 1976. The service follows its usual pattern, but for this recording both the Boy Choristers and the Girl Choristers are heard on their own with the gentlemen as well as together. The Introit and the setting of the Canticles were commissioned for the cathedral in 2013, a year which saw the visit of the Lindisfarne Gospels to this World Heritage site. The Anthem is that composed by Samuel Sebastian Wesley for Evensong on Easter Day 1834, an occasion on which only Trebles and a single Bass voice were available (which tells one all one needs to know about the state of cathedral music at the time). It must be said that Wesley made the most of the limited resources at his disposal, creating a work which has remained enduringly popular. The famous full-organ chord, for all its humorous aspect, is a wonderfully effective device, but also unrepeatable - as Donald Hunt has written in hios biography, “Wesley has the copyright for all time”. Central to the liturgy, of course, is the psalm, in this case Psalm 105, a great recital of God’s acts and his faithfulness to his people - a psalm used when Jerusalem’s worship was founded under David (as related in 1 Chronicles. 16. 8ff), and reminiscent in both span and subject of the epic Psalm 78. 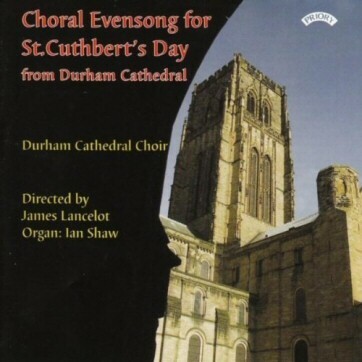 Framing the service are hymns in the English tradition (albeit in both cases with German tunes) and voluntaries - Quitessentially English beforehand, and French afterwards, its genisis in Easter plainsong recalling Durham’s own monastic roots. Herbert Howell’s Rhapsody No 1 was composed in August 1915 and dedicated to Dr Arnold Darke. This lyrical and heartfelt outpouring uses Howell’s favoured arch form; bookended by delicate and gently-undulating passages, whilst building to an impassioned central climax before finally coming to a tranquil and restful end in the comforting and enveloping warmth of D flat major. First the sun, then the shadow is one of three anthems directly related to Durham Cathedral and the present archbishop of Canterbury, Justin Welby. When he was Dean of Liverpool, Justin commissioned my Advent Anthem (to words by the then Archbishop of Canterbury, Rowan Williams) to celebrate the 80th birthday of his mother, Jane. It was subsequently sung by Durham Cathedral Choir at Justin’s Enthronement as Bishop of Durham. As a result of this particularly fine performance, Durham commissioned me to set another Williams poem, Emmaus, which begins “First the sun, then the shadow”. (Emmaus is the biblical village, the road to which is in itself a symbol of profound journeying). Before I could finish the composition the meteoric, indeed sun-like, rise of the new Bishop in the Anglican Church’s hierarchy overtook me, when Justin was appointed Archbishop of Canterbury in succession to Rowan Williams. Returning Justin’s compliment to Jane, his family asked me to write a short and simple anthem (Listen, listen O my child to words from the Rule of St Benedict) for the Enthronement in Canterbury Cathedral. This then preceded the first performance of the new Durham anthem. My association with Durham Cathedral has been a particularly happy one with the choir, directed by James Lancelot, recording the Advent Anthem and then taking to their hearts First the sun, then the shadow. I was very struck by the musical contrasts that Rowan Williams conjures up in his poem Emmaus and its sense of mystery and awe: “We cannot learn this rythm we are asked to walk”. In many ways it is not an easy poem to set but what I like as a composer is words that are elliptical, fleeting yet powerful. It’s why I have been drawn to Rilke in another recent work. First the sun, then the shadow is also about sound, the hearing of sound, and there are many references that need, I think, an equally elusive musical treatment to complement the literary language. Of the canticles, John Casken writes: My Magnificat and Nunc dimittis was composed to mark the return of the Lindisfarne Gospels to the North-East of England. The book, dating from the 7th century, is one of the finest examples of Anglo-Saxon illuminated manuscripts, made by Eadfrith, Bishop of Lindisfarne who died in 721 in honour of St Cuthbert. This deeply spiritual act was foremost in my mind when I was writing the work, and for this reason the musical setting of the opening words ‘My soul doth magnify the Lord’ is intended to be devotional. I have marked the piece quietly joyful in an attempt also to reflect the mystery of Mary’s words at the visitation of her cousin Elizabeth. ‘For he that is mighty’ and ‘ He hath shewed strength with is arm’ invite a more vigorous response to the words, but throughout, the trebles’ opening musical phrase returns in some way to remind us of the importance of the first line of the Magnificat. The Nunc dimittis is built on a rocking rhythm with irregular metres lending a gentle swaying character. At the climatic point, ‘Israel’, the organ has a brief interlude which serves as an introduction to the doxology ‘Glory be to the Father’. It reminds us that the organ plays an equally important part to that of the choir in this work, and it is the organ at the very end which brings back the Magnificat’s opening phrase. Magnificat and Nunc dimittiswas commissioned by Durham Cathedral with support from Durham Cathedral Choir Association and Lindisfarne Gospels Durham through its Arts Council grant. 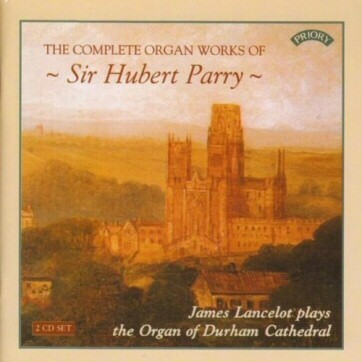 It was first performed on 30 June 2013 in Durham Cathedral by Durham Cathedral Choir conducted by James Lancelot, with Francesca Massey, organ. In 1930-31, Charles Tournemire recorded five improvisations on the magnificent Cavaillé-Coll organ of Saint-Clotilde, Paris. In 1958, his pupil Maurice Duruflé set about the painstaking and admirable task of transcribing these works from acetate disc, often working in the dead of night to minimise background noise, and slowing the recordings to half-speed the help decipher complex passages. In the tumultuous Choral-Improvisation on the Easter Sequence Victimae paschali laudes, Tournemire perfectly encapsulates the drama and magnificence of the rending open of the tomb and the ecstasy of the Paschal Victim’s triumph over death, whilst the exquisite heart of the work makes imaginative and poetic use of Sainte-Clotilde’s most expressive colours. 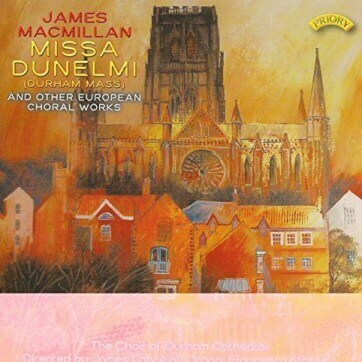 James MacMillan gets star billing on the booklet cover, although his Missa Dunelmi, his sole contribution to this CD, takes only a little over 18 minutes to perform. Never mind – it is a gorgeous work, and if it were the only music on this CD, I’d still be likely to pay full price for it. As one expects from this composer, Missa Dunelmi is of visionary intensity – very much of the present time, yet, in its ecstatic and almost relentlessly overlapping polyphony, an echo of the English renaissance tradition. This is its first recording. 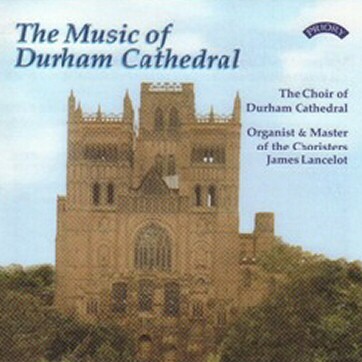 No surprise there, as it was commissioned by Durham Cathedral, and first performed there on February 27th, 2011, less than a year before this CD was recorded. Missa Dunelmi is set for eight-part choir a cappella and is in four movements. (MacMillan conflates the ‘Sanctus’ and ‘Benedictus’.) If the remainder of the programme on this Priory CD is too unlike it for you – perhaps your interest lies primarily in contemporary music – you might want to wait for a forthcoming disc by the Glasgow-based ensemble Cappella Nova. Recorded last November for Linn Records, that disc will contain the Missa Dunelmi (with the composer conducting) as well as other works by MacMillan and John Taverner. Having said that, I’m eager to compare the two recordings, as the Choir of Durham Cathedral is an ensemble of girls and men; the booklet lists 29 names. Cappella Nova is an award-winning group comprising adult women and men and is less than half the size of the Durham Cathedral Choir. Stay tuned! Another French connection in this programme (yes, I know he was born in Belgium!) is César Franck’s Panis angelicus, which has been used and abused countless times since the dawn of sound recording. Here, it is performed with lovely, devout simplicity and purged of the sentimentality which is often forced upon it. Hearing it in this way is like seeing a restored painting by Titian. This is immediately followed by one last work from across the Channel, Jeanne Demessieux’s Te Deum. The juxtaposition is appropriate, given Demessieux’s lifelong advocacy of Franck’s organ music. It is a grand and sturdy work, based on the eponymous plainchant, and characterized by typically French imagination and regard for colour and drama. Francesca Massey, who gives such reliable and sensitive support throughout this CD, deserves this opportunity to shine on her own and she makes the most of it. This is wonderful playing. The balance of the programme is made up of English choral works from relatively modern times, with Charles Villiers Stanford, Charles Wood and Hubert Parry representing the old guard. Among the most interesting of these is Michael Berkeley’s Advent Anthem, another recent work. Berkeley’s setting truly captures the ‘terrible beauty’ of Rowan Williams’s poem, in which November’s death and decay are succeeded by images of the ‘bursting red December sun’ and Jesus’s arrival ‘like crying in the night, / like blood, like breaking, / as the earth writhes [here, the music writhes in turn] to toss him free’. The Durham Cathedral Choir never lets the composers down; this is choral singing I would be glad to encounter anywhere and it well merits repeated listening. If you require a sample before deciding, consider Wood’s Hail Gladdening Light, whose climax takes the girls into the stratosphere without a trace of strain or intimidation. The sound on this disc is realistic. For best effect, set the volume to lifelike levels … but don’t blame me if the neighbours complain! Since earliest times human beings have sung. Or so it seems: until recently scientists have been more prepared to discuss the evolution and purpose of birdsong than of its human equivalent. Birdsong, it appeared, was more straightforward: an aural equivalent of highly-coloured feathers or courtship dance. Even Darwin, though, struggled to suggest that human song was developed solely for the purpose of showing off and attracting a mate; (the modern phenomena of karaoke and talent shows might have caused him to modify his view). Writing in The descent of Man he supposed that song and vocalisation were the precursors to speech. More recently, the American scientist and rock musician Daniel Levitin has observed that, “Music may be the activity that prepared our pre-human ancestors for speech communications and for the very cognitive, representational flexibility necessary to become humans.” I sing, therefore I am, perhaps. Or, as the Abba song puts it, “she says I began to sing long before I could talk.” If song predates speech, perhaps it retains the ability to link to something unsayable, something eternal. Far from giving way to speech and shrinking, like a human tail, to some vestigial trace, song seems to have hung around for millions of years to enhance speech and give it fullest expression. There is an element of mystery about this: music is found in every culture and society, but it is non-adaptive: it serves no evolutionary purpose. Music, so often described as a ‘universal language’, is in fact neither universal nor a language, lacking in images, symbols or the ability to communicate exact meaning. For some scientists, including the very musical Steven Pinker in his book How the mind works, “music is auditory cheesecake, an exquisite confection crafted to tickle the sensitive spots of at least six of our mental faculties.” And many of the pieces in this programme can be enjoyed in such a way: sacred choral music has the ability to soothe and satisfy; its spiritual nature can often transcend its religious content. Some of the settings make their effect through the creation and manipulation of musical space and drama: Leighton’s Let all the world and O magnum mysterium create vivid sound-worlds that would be effective and enjoyable without their texts, as purely instrumental music; cornetts and sackbuts could take on the textures and rhythms of Gabrieli’s O magnum mysterium and produce a very satisfying instrumental canzona. There are those who whish for more from their music, however, and there is much more to draw from the music in this collection. The poet Elizabeth Bishop declared, “I am in need of music that would flow Over my fretful, feeling fingertips, Over my bitter-tainted, trembling lips, With melody, deep, clear, and liquid-slow.” The focus on harmony and counterpoint of so many of the pieces on this disk throws the examples of melody into sharp relief: in Poulenc’s setting of O magnum mysterium, the treble melody floats above the incense-rich clouds of lower-voice harmony like hills rising above clouds on a spring morning; a similar effect, but with a less dark backing, is achieved in Richard Lloyd’s Magnificat from the St Hild Service. Bainton’s And I saw a new heaven, a favourite with generations of singers, succeeds partly because of the drama of its word-setting (take, for example, the rising phrase given to the basses on “and I heard a great voice out of heaven”, followed by the brass-like choral chords for “behold, the tabernacle of God is with men”) but equally because of the lyrical quality of its melodies, especially the unforgettable tenor phrase towards the end, at “God shall wipe away all tears”’ where the melody, at first setting the text syllable-by-syllable, returns twice to its initial pitch before finally breaking off heavenwards with a melisma on “away”. Although words and music are undoubtedly effective each on its own terms, when well-matched they produce an effect that is more than the sum of their parts. The ‘meaning’ of such compound musical settings is complex and evades analysis. When the Overlords, those intellectual alien beings in Arthur C Clarke’s novel Childhood’s End, pay a visit to an earthly musical concert, they listen politely, commend the composer’s ‘great ingenuity’, but leave puzzled, because music does nothing fro them. The neurologist Oliver Sacks, in his book Musicophilia, imagines them returning to their spaceships, discussing the phenomenon they have just encountered, reasoning that it must have some unknown beneficial function for the humans. So music is in some way parallel to religion, necessary to many yet impossible fully to explain, a conundrum for the rational evolutionist. And it is in service of religion that music reaches some of its most profound expression. The pieces in this recital echo the eternal human and sacred themes of Advent: hope and expectation; wonder and celebration of new beginnings; and contemplation of our own end-time. It was to bring together sacred texts and music that cathedral choirs such as Durham’s were first developed from rows of singing monks in the fifteenth century. The tradition has continued unbroken except for a few years during the Commonwealth, persisting against the odds because of its versatility and its dedication to the purpose for which it is so well suited, that of elevating the thoughts and prayers of individuals and communities,bringing them closer to a perception of something beyond the merely ordinary. The passionately atheistic evolutionist Richard Dawkins allows a grudging respect for this tradition when explaining why people chooses one religion over another (in A Devil’s Chaplain): “no doubt soaring cathedrals, stirring music, moving stories and parables, help a bit.” This recording captures some of the soaring acoustic of Durham Cathedral; few of the texts are narrative, but the combination of music and text creates sound parables. All the pieces recorded here come from the modern daily repertoire of an English cathedral choir. As functional settings they use a conservative musical language and texts, biblical and devotional, which frequently predate the music by several centuries. Remarkably, none of the composers strives to be contemporary. Many of them, although writing at a (pre-antiquarian) time when there was little interest in earlier musical styles, have chosen to use established harmonic language from at least 50 years before the date of their compositions: Byrd (1605), Tallis (1575) and Handl (c1585) all adopt the contrapuntal style of the mid sixteenth century; Bairstow (1902), Bainton (1928) and Harris (1959) write in the mainstream European Romantic style of the late nineteenth century. Perhaps most remarkably of all Schütz (1648), who had studied with Giovanni Gabrieli from 1609 to 1612 and who had returned to Venice in 1628 to update himself with the style of Monteverdi and the early Italian baroque, falls back on a mixture of homophony and counterpoint more typical of Lassus a hundred years earlier. 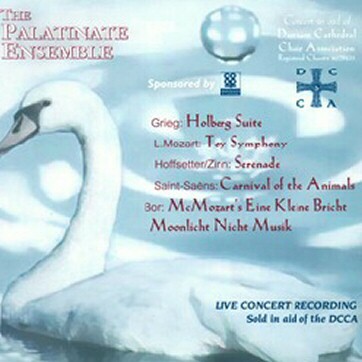 There are occasional elements of more modern music: Gabrieli and Leighton inject lively rhythms; Poulenc and Leighton employ some chromatic harmonies - as does Weelkes, with a lurch onto a sharper chord to paint the phrase “tune thy heart” - but all steer well clear of any sense of the avant-garde. Dr Michael and Elizabeth Boyd, regular members of the congregation at Durham Cathedral, generously provided funds to commission the composition of the St Hild Service to mark their golden weeding anniversary in July 2009. 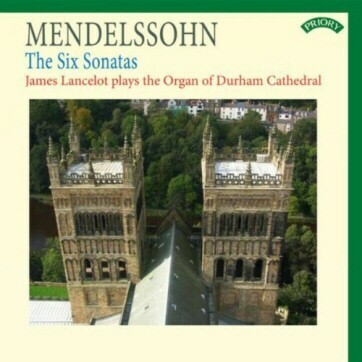 Through the Durham Cathedral Choir Association, and following the advice of James Lancelot, Richard Lloyd, a former organist at Durham, was approached. This setting of the Magnificat and Nunc dimittis is Richard Lloyd’s twelfth. 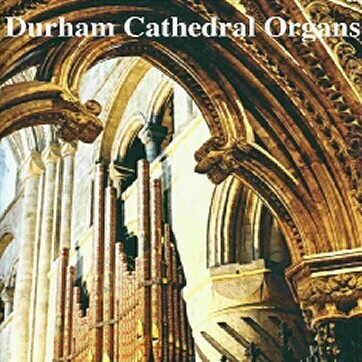 Durham already has his Durham Service, written for the 1991 Northern Cathedrals Festival. In contrast to the rather grand Durham Service, the style of the St Hild Service was given at Evensong on 15 November 2009 in the presence of Michael and Elizabeth Boyd and Richard Lloyd. 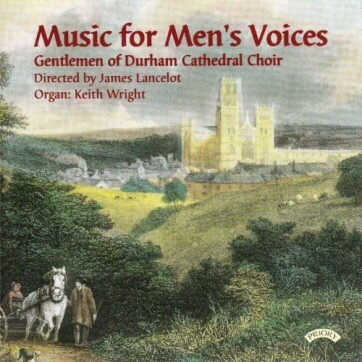 The performers were the men and boys of Durham Cathedral Choir, with Keith Wright (organist), conducted by James Lancelot. Strong links have been made between Durham and Paris/Versailles as a result of our musicians touring there in 2008 and 2009. 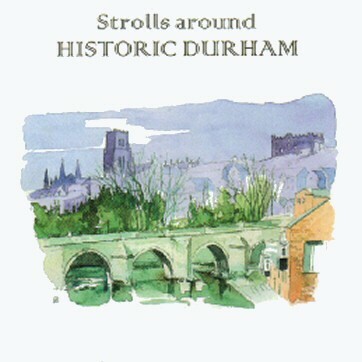 Benoît Roman D’Amat, a Parisian artist, has produced some lovely contemporary watercolour pictures of Durham which have been made into a delightful booklet Strolls around Historic Durham with historical notes. It is on sale in the Cathedral Shop for £5, or by post from the Chapter Office, The College, Durham DH1 3EH (cheques to DCCA for £6.50 inc p&p). 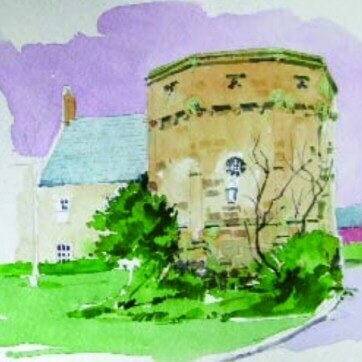 Exhibitions of original watercolours by Parisian artist Benoît Roman D’Amat have been held in the Galilee Chapel and the Undercroft Restaurant. Watercolours are for sale in specially made oak frames with triple mounts. They are for sale at a reduced price of £99 each (previously £150). 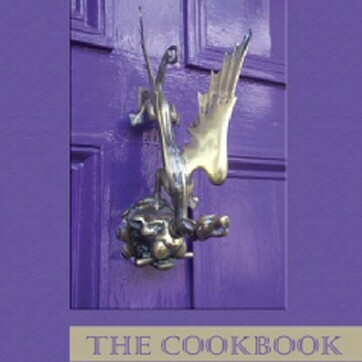 Our recipe book contains recipes submitted by Chorister School pupils, past and present, their families, and by other members of the Cathedral community, with illustrations mostly by Chorister School pupils. The book is on sale in the Cathedral shop for £3 or by post from the Chapter Office, The College, Durham DH1 3EH (cheques to DCCA for £4.50 inc p&p). 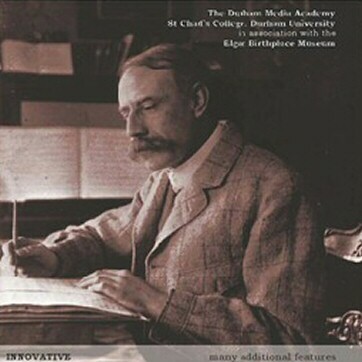 The Durham Media Academy at St Chad's College, in association with the Elgar Birthplace Museum, has produced an absorbing documentary exploring Elgar's Organ Sonata from just about every conceivable angle. 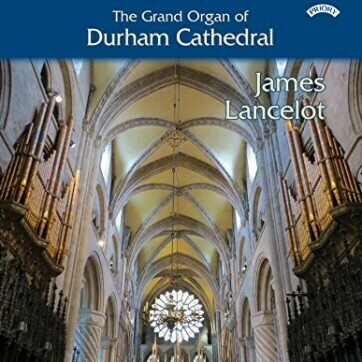 The work is performed by Canon James Lancelot, Organist of Durham Cathedral and a Fellow of the College. In the 150th anniversary year of Elgar's birth, James's outstanding performance of this first organ sonata brings the music to life by realising its full colour and majesty. In collaboration with the Elgar Birthplace Museum, a valuable insight into Elgar - both the man and his work. A tour of Harrison & Harrison, restorers of the Durham Cathedral Organ, to discover the art and science behind successful organ building. A virtual conversation among Professor Jeremy Dibble, the distinguished Elgar expert Relf Clark, and performer James Lancelot who analyse this work and its evolution. 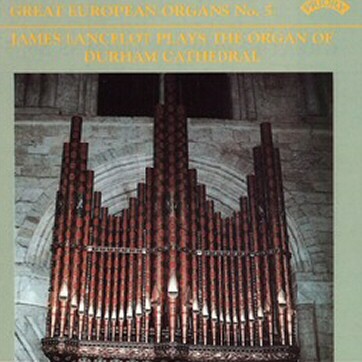 A masterclass given by James Lancelot, who also undertakes an organist's eye-view of the Durham Cathedral Organ. This recording features highlights of the Consort’s nineteenth- and twentieth-century repertoire.Some of its is authentically sung by a mixed choir such as this; some of it was conceived for an all-male choir, such as Finzi’s Lo, the full, final sacrifice, a Walter Hussey commission for St Matthew’s, Northampton. The programme opens and closes with extended and atypically Latin double-choir settings of Magnificat and Nunc dimittis, Stanford’s being composed in memory of Hubert Parry and bearing a sad dedication which is all too eloquent in view of the two composers’ long-standing disagreement. Wood’s Nunc dimittis is less ambitious in scope, but its block-choir eight-part writing gives it an atmosphere of grandeur and splendour (both Holst and Howells would exploit similar textures in setting the same words in the following decades). For the rest, the music comes from continental Europe: Brahm’s magnificent setting of part of Psalm 51, scholarly yet passionate, and his serene (but canonically fascinating) Geistliches Lied; Rheinberger’s evocative evening hymn Abendlied, its text imbued with the resonance and emotion of the story of the road to Emmaus; Mendelsshon’s Hear my prayer (sung in its quaint metrical English version) needing neither introduction nor apology; Bruckner’s magisterial Ave Maria, intimate yet grand; and Grieg’s characteristic setting of the Marian hymn Ave maris stella, technically simple yet clearly and immediately permeated by the influence of Norwegian folksong. I would make special acknowledgement of Oxford University Press’ anthology European Sacred Music, edited by John Rutter, an invaluable publication which has served as both quarry and signpost. 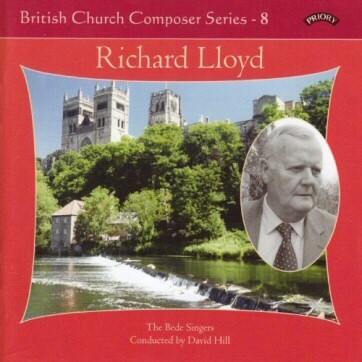 Richard Lloyd was the Organist and Master of Choristers of Durham Cathedral from 1974 to 1985. During that time both David Hill and Ian Shaw were Sub-Organists with him at Durham . 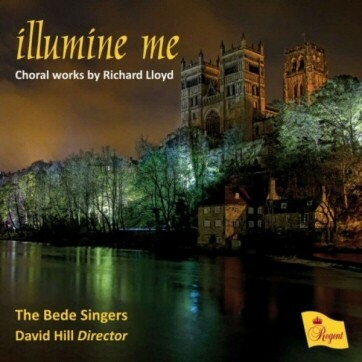 The Bede Singers is a group of former members of Durham Cathedral Choir, augmented by a number of soprano choral scholars at Cambridge University who got together in 2006 to produce this recording. 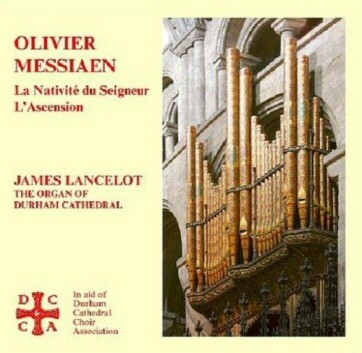 Messiaen's Organ Cycles: La Nativité du Seigneur and L’Ascension played on the Organ of Durham Cathedral by James Lancelot. The arrival of yet another organ-compilation CD might seem to cal at least for an explanation if not for an apology. 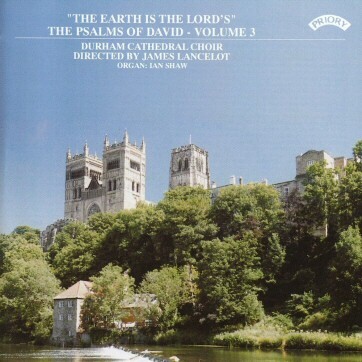 First, this recording is intended as a souvenir of Durham, a vignette in sound for the pilgrim or tourist to take home. Second, it is a permanent record for our regular recital-goers of some pieces they have especially enjoyed hearing in recent years. Third, through the generosity of all concerned with its production, it will help to raise funds towards the completion of the cleaning and overhaul of the organ on which it was made (the console and the north side were so treated in the 1990s; the south side awaits attention). But, even if that were sufficient excuse, we make no apology for offering a wider audience the opportunity of hearing, familiar repertoire newly interpreted on this magnificent instrument. Recent research and the historically-aware restoration of many organs of different nationalities and periods have given the modern listener greater insight into the sound-worlds of much of the music presented here. 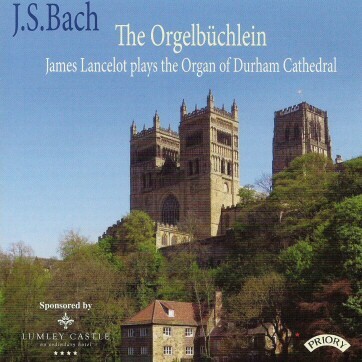 But the cathedral organ at Durham remains a supremely fine example of its type, and if it is most truly home in English Romantic repertoire it is none the less able to articulate a wide variety of styles and periods in a coherently musical manner. For the rest, we have aimed to capture the mood of an evening spent in the cathedral on our own, with good music and a wonderful instrument for company. We hope the listener will enjoy eavesdropping as much as we have enjoyed playing. Nineteen extracts of Choral and Organ pieces taken from discs made between 1988-2002. 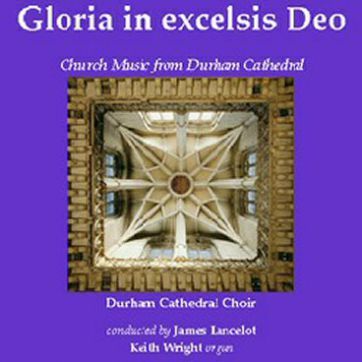 This collection sung by the Choir of Durham Cathedral over the last 15 years, represents music that is performed regularly throughout the choir’s year. In addition the Cathedral’s famous Harrison & Harrison organ is heard. It is one of the finest of its type in the UK. 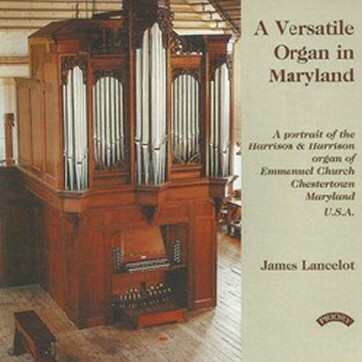 A portrait of the Harrison & Harrison organ of Emmanuel Church, Chestertown, Maryland, U.S.A.
Each English Cathedral has amassed its own collection of music over the years. Much of this will be shared with other places - the vast majority of music performed at Evensong day by day through the land has been composed by men who were Choristers, Lay Clerks or Organists of cathedrals - but each cathedral probably also has some music unique to itself. Durham Cathedral, albeit one of the greatest buildings in the world, nevertheless cannot boast a Weelkes or a Wesley; for while William Smith’s Preces and Responses are known far and wide, and Richard Lloyd’s music continues to reach and delight an ever-growing number, few if any of its remaining composers have found fame at large. Yet, as this recoding demonstrates, such obscurity is in many cases undeserved. Opening with a plainsong hymn from the 12th century in honour of St Cuthbert, the recording then explores service music, verse anthems and full anthems from the Tudor period. Bishop Cosin’s translation of the ancient Latin hymn Veni, creator Spiritus (arguably Durham’s most significant contribution to English literature and a text ordained for use at Ordinations not only in the Prayer Book of 1662 but also in the Alternative Service Book of 1980) brings to a close the early period. A single example of J.B. Dykes’ prolific output opens a more modern chapter, which includes music from the last hundred years, and especially that of Richard Lloyd (whose prolific æuvre really deserves a recording to itself). This section also includes two items from a series of works specifically commissioned for the Cathedral by the Dean and Chapter. The first such work was the Ikon of Saint Cuthbert of Lindisfarne by John Tavener, written in 1987 for the 1300th anniversary of the Saint’s death; it may be heard on the Priory recording Choral Evensong for St Cuthbert’s Day. 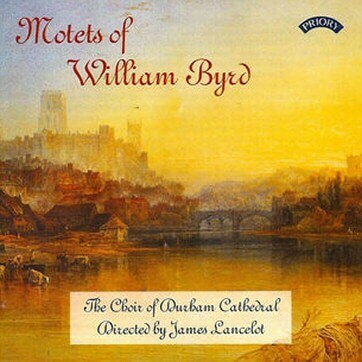 The series has continued with Richard Lloyd’s Durham Service and Francis Grier’s Thou, O God, art praised in Sion; coupled to it may be John Casken’s Sunrising, written as a gift to the Cathedral in the 900th anniversary year of the present building in 1993, upon the composer’s leaving Durham to become Professor of Music at Manchester. Without such generosity, and without the devotion of those who (from John Brimley to Ian Shaw) have given of their talents and the goodness of their hearts to write music for use in the Cathedral, this recording could not have been made. It would not have been possible, either, without the work of Simon Anderson, who has reconstructed and copied much of the early music heard here. He would be the first to pay tribute to Dr Brian Crosby, himself a long-time Alto Lay Clerk at Durham and a Master in the Chorister School; his life-long study of the music of Durham and his cataloguing of the music in the Dean and Chapter Library has laid foundations which will continue to be built upon for generations. The Fantasia by William Smith was transcribed by Andrew Fowler, many other of whose editions and reconstructions are in regular use here too. All three will have left Durham or retired from active service by the time this recoding is released; I am glad to pay public tribute to them in introducing a recording which will stand inter alia as a monument to their work. With his complete setting of the Morning and Evening Services and Offices for Holy Communion in B flat Op. 10 (1879), written for the choir of Trinity College, Cambridge, Stanford developed a new, vibrant and original concept of symphonic church music (see Priory PRCD437). Already accomplished as a composer of orchestral and concerted chamber music, Stanford brought to the well-worn texts of the Anglican liturgy an instrumental orientation which at once superseded contemporary settings by Elvey, MacFarren, Hopkins, Garrett, Stainer and S.S. Wesley. In developing the ‘instrumental’ dimension of a liturgical idiom that, in order to emphasis the religious sentiment of the text, had until then always been primarily ‘choral’ (and deliberately archaic in style), he was frequently able to draw a parallel between conventional movements of the symphony and the choral settings of standard items such as the Te Deum (first-movement ‘Allegro’), Magnificat (Scherzo) and Nunc Dimittis (slow movement). Links between choral ‘movements; were also reinforced by the cyclical method of thematic cross-reference, a technique gleaned from the symphonic repertoire of Stanford’s immediate forbears such as Schumann and Liszt. In establishing audible connections between the various parts of the choral service, Stanford was also able to create the effect of musical homogeneity across the entire scheme of the Sunday liturgy, thereby enhancing the overall experience of the congregation. It was with the success of this first experiment that Stanford embarked on his second major cycle, The Service in A major Op. 12, as the result of a commission from John Stainer. Stainer’s request was for a setting only of the Evening Canticles (Magnificat and Nunc Dimittis) which were to form part of the annual Festival of the Sons of the Clergy of St Paul’s Cathedral in May 1880. Since the forces at Stanford’s disposal for the Festival were orchestral, his initial conception of the Magnificat and Nunc Dimittis were quintessentially orchestral ( a feature evident from the prominence and difficulty of the organ part). Completed in February 1880 both movements exhibit a consolidation and expansion of the symphonic dimensions of the B flat service. This is particularly apparent in the conspicuous role of the organ in the Nunc Dimittis (an archetypal ‘slow’ movement) which features a rich lyrical duet in the tenor register, originally conceived for divided celli. Together with the melancholy strains of the oboe in the central phase (‘which Thou hast prepared’), the heraldic scoring of ‘ To be a light to lighten the Gentiles’ and the affecting ‘hushed’ return of the opening material, this setting must stand as one of Stanford’s most fervent utterances in all his church music. As the music lists as Trinity College, Cambridge show, the A major Evening Service was soon adapted for organ accompaniment and became a regular feature of the choir’s repertoire as did a number of Stanford’s anthems and introits. Moreover its passionate emotionalism and harmonic resourcefulness provided a significant paradigm for Stanford’s contemporaries such as Parry (notably his ‘Great’ Service in D major written soon afterwards in 1881), Thomas Tertius Noble, Alan Gray (both of whom assisted Stanford at Trinity College) And Charles Wood. 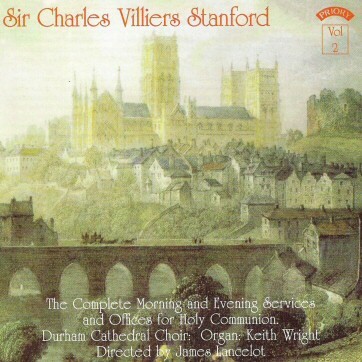 Such was the popularity of the Service in B flat that Novello succeeded in persuading Stanford to provide further settings of the Morning, Communion and Evening Services. In 1889 a Service in F Op. 36 was completed (with optional organ) and in 1895, three years after his resignation as organist at Trinity College, he composed the Morning and Communion parts of the A major Service. In the Te Deum Stanford composed one of his most monothematic and discursive movements drawing on quite new material. For the Benedictus, a dialogue based essentially between the basses and the rest of the choir, and the Jubilate Deo a link was forged with the Evening music by the use of the same setting of the Gloria. For the Communion Offices Stanford produced settings of all the choral parts of the liturgy (except the Benedictus qui venit and Agnus Dei); this included the Responses to the Commandments, the Gospel responses (not sung here) and the Sursum Corda. For the Credo the composer returned the the brisk &frac34; Allegro temp of the Te Deum and Magnificat, and from the latter derived the main melodic material of the opening idea (an upward scale from A to E followed by a downward leap back to A). Like the Te Deum, the Credo is largely constructed on the one thematic element, an organic process of symphonic development broken only by the musical genuflection (‘And was incarnate by the Holy Ghost’) in F major. The use of such tonality, and its striking effect, was one already used in the Magnificat (e.g. ‘He hath shewed strength with His arm’). The Gloria in Excelsis similarly gravitates towards both C major and F major and moves flatter still towards the Neapolitan (B flat major) before its conclusion (‘art most high in the glory of Thy people Israel’). For the coronation of Edward VII in 1902 Stanford orchestrated his Te Deum in B flat and the following year he orchestrated the rest of the service. During 1902 he also began work on the Morning, Communion and Evening Service in G Op. 81 which he dedicated to his one-time colleague at the Royal College of Music, Sire George Martin who was organist at St Paul’s Cathedral. It was published by Houghton & Co. In 1904 and the Magnificat and Nunc Dimittis were orchestrated by the composer in May 1907. The Service in G signals a departure both in its more intense symphonic handling of its material and also in the cyclic dimension. The opening of the Te Deum (‘We praise Thee, O God’) introduces an idea which is then taken up as the central theme of the doxology heard at the close of the Benedictus, Jubilate, Magnificat and Nunc Dimittis. This technique Stanford was to work to even greater effect in the Service in C major Op. 115 (See Priory PRCD 437). Allied with this increased sense of cyclic unity is a more organic method of development enriched by a wide harmonic vocabulary. Inevitably this gave rise to a more sophisticated attitude towards structure and tonality. This is particularly interesting in the larger movements such as the Te Deum, Credo, Gloria and Magnificat which Stanford confronted with his usual imagina-tion and flair, but the shorter movements, notably the Nunc Dimittis, also reveal a greater degree on involution. The Te Deum, by far the most substantial of all the texts, falls back on the comparable plan of the Te Deum Op. 10. Here Stanford opts for a division of four main textual sections in which the last recapitulates and reworks material from the first. However, this ostensibly simple procedure is executed with great deftness, for in the third, appropriately more tranquil section (‘We therefore pray Thee’) Stanford sets this in doleful G minor which is carried through to the recapitulation (‘O Lord, have mercy upon us’) before reverting to the tonic major. The Benedictus, a modified ternary structure, it also concise in its handling of the text. Especially striking here is the rapid tonal divergence in the middle section (‘And thou, Child’) and the recovery (‘To give light to them that sit in darkness’) which restates the opening idea but in truncated form.The closing phrase (‘and to guide our feet into the way of peace’) is a gem. For the shorter text of the Jubilate Deo Stanford constructed a monothematic through-composed form whose interest lies primarily in its tonal explorations. Perhaps most distinctive of all is the climatic arrival on the Neapolitan (‘and speak good of His Name’) which subsides, tranquilly, on to the dominant G with the opening ideal sung by a quarter of soloists. For the communion Service Stanford provided different responses to all ten commandments and to the Gospel (the latter not sung here). The Credo, like the Jubilate, is largely monothematic and features some of Stanford’s most experimental harmony, notably at the dramatic juncture ‘and the third day He rose again’. This moment is initiated by a telling reference to E flat major which appears again as the key of the Sanctus, a splendidly concise miniature with the most sumptuous closing progressions. One of the characteristics particular to the Gloria in Excelsis is its emphasis on lyricism. Already there had been a hint of this stylistic penchant in the third section of the Te Deum (see above), but in the Gloria the emphasis on melodic writing goes much further as if to suggest the influence of the Lieder tradition (e.g. ‘O Lord, the only begotten Son’), an impression reinforced by ‘pianistic’ running quavers of the organ accompaniment. This and the felicitous antiphony of solo treble and answering choir (‘That takest away the sins of the world’) does much to anticipate the memorable and unique sound of the Magnificat, undoubtedly the best known and best-loved movement of the Service. Here the Schubertian image of ‘Gretchen am Spinnrad’ provides a compelling reinterpretation of the song of Mary. The Nunc Dimittis is equally inspired. Germane to its structure is a deftly simple cadential formula heard at the outset which is given textual identity at the end of the solo bass’s first strain (‘depart in peace’). Permeating the entire movement this brief idea is used to great effect in the closing stages of the Gloria not only at the final cadence (‘Amen’) but also, more subtly, in the exquisite wilting phrases of ‘world without end’. The assimilation of the Gloria into the Nunc Dimittis (and not merely as an appendage), the manner in which initial reference is made to the original ‘Gloria’ material and, most affectingly, the way in which former exultation is transformed into contemplation must lie amongst Stanford’s greatest musical achievements in church music. Francis Jackson has been on of this century’s foremost English organist-composers, maintaining the tradition of his predecessors as organist of York Minster, Thomas Tertius Noble and Edward Bairstow. He studied with Bairstow, and sang in the Minster’s choir as a boy, before being appointed organist at the conclusion of his war service in 1946. This short fanfare was written for the enthronement of Archbishops Coggan in 1961, and includes a brief reference to the dotted ‘fanfare’ rhythm of Stanford’s B-flat Te Deum.Vaughan Williams came from a Gloucestershire family of churchmen, and was educated at Charterhouse, Trinity Cambridge and the Royal College of Music, where he came under the influence of Stanford and Parry. He studied further, with Bruch in Berlin and Ravel in Paris, and then returned to the RCM in 1918, as Professor of Composition. Apart from his compositions, which include operas and symphonies, he was also largely responsible for The English Hymnal and The Oxford Book of Chorals, for both of which he was the musical editor. Surprisingly, for one so in-volved with Church music, he wrote very little for the organ: notably, three hymn-preludes and the Prelude and Fugue in C minor. The fugue was composes a few days before the prelude, in 1921, and both movements were later revised and arranged for orchestra. After the rhapsodic prelude, the fugue has a Brahmsian flavour, enhanced by the juxtaposition of triplet and duplet figures. William Harris, a Londoner by birth, was also educated at the RCM, studying under Parratt and Walford Davies. He led an active life in Church music, working in turn at Lichfield Cathedral, New College and Christ Church, Oxford, and St George’s Chapel, Windsor Castle, where he was organist from 1933 to 1961. He was closely involved with many royal occasions, among them the funeral of George V in 1936 and the coronations of 1937 and 1952. The Prelude was begun on a trip to Leipzig which Harris made with a friend in 1930; upon arriving at the Thomaskirche, he took up pencil and paper, and sketched this short piece in the same mould as Bach’s Air on the G String. Charles Macpherson, despite being a native of Edinburgh, spent most of his life in close association with St Paul’s Cathedral in London; he was first a chorister, then assistant organist, and finally, from 1916 until 1927, organist there. He was also Professor of Harmony at the Royal Academy of Music, and wrote numerous books on theoretical subjects. This Andante comes from the collection of pieces written for Sir Hubert Parry’s memorial service, which was held in St Paul’s in 1918. Among the other contributors were such figures as Stanford, Ivor Atkins, Henry Ley, Frank Bridge and a youthful George Thalben-Ball. Harvey Grace’s name is associated with Musical Times, which he edited from 1918 until his death. He was also an accomplished practical musician, playing the organ at several London churches (is teacher was Arnold Richardson, organist at Southwark Cathedral) and directing the St Cecilia festivals. The hymn-tune Martyrs is a Scottish Psalm-tune dating from 1635, set to the words ‘O God of truth, whose living word’ in The English Hymnal. The melody is notable for its almost-modal austerity, and its dour solemnity. Bossi made his name as an organist in the nine years he spent at Como Cathedral. For the last 35 years of his life he held no permanent church post, but taught in Venice, Bologna and Rome, and built a career as a virtuoso recitalist. He dies at sea, returning from a concert tour of the USA. He tried his hand at most types of composi-tion, including opera, but is remembered for just a few organ pieces. The Scherzo in G minor is a masterpiece of creativity: with the slightest of material, Bossi achieved the most persuasive effects, by means of perpetual forward motion and several small climaxes. Brahms was one of the very few ‘mainstream’ composers after Bach to write for the organ: between them, Mozart, Haydn, Beethoven and Schubert produced only a handful of works. As with his younger contemporaries, Karg-Elert and Reger, Brahms felt himself to be part of the Bachian tradition, and concentrated on chorale-based works and preludes and fugues. The Opus 122 collection of chorale preludes dates from Brahms’ last year, 1896: seriously ill with liver cancer, and grievously affected by the death of his close friend, Clara Schumann, he wrote 11 preludes on predomi-nantly reflective hymns. The ghost of Bach stalks this first prelude, with sinuous manual lines standing in relief against the melody in the pedals. Karg-Elert was a chorister at St John’s church in Leipzig, and began to compose at an early age. After a short time teaching, at the Magdeburg Conservatoire, and serving in the Great War as a bandsman, he succeeded Reger as a tutor at the Leipzig Conservatoire. It was Reger who persuaded Karg-Elert to write for the organ: his first love had been the harmonium, and he also enjoyed some fame as a pianist. Freu dich sehr is a gentle sarabande in G major; Lobe den Herren is a festive allegro in B flat; and O Gott, du frommer Gott is a simple, devotional setting of a hymn which takes the form of a prayer for safety in all dangers, including death. This last piece was dedicated to Karg-Elert’s mother, and composed on the day she died, November 13th, 1908. Hindemith trained as a violinist in Frankfurt, and led a busy life as a performer in the interwar years, leading orchestras and playing the viola in his own string quartet. In the 1920s he turned more to composition, and began to gain some recognition, but the Nazis denounced his music as ‘degenerate art’. He lectured at Yale University, USA, from 1939 until 1946, before returning to Europe, to work increasingly as a conductor. His works cater for virtually all forces, from piano duet to concert band, and he contributed to the solo sonata repertoire of most popular instruments. His three organ sonatas are often labelled ‘neo-classical’, implying that they require a Bachtype organ, but in fact all they need is an instrument which has balanced choruses and, above all, clarity. The Third Sonata was given its premiere by E Power Biggs at Tanglewood, Massachusetts, in 1940. The work is based on German folk-tunes, which Hindemith treats in a quasi-baroque manner. The first movement has the melody (‘O Lord, to whom should I complain....’) as the bass of siciliano, and then in the treble in a chordal setting; the second movement (with the melody ‘Awake, my treasure...’) is very slow, and has the tune in the left hand. The final movement is more agitated, and the melody (‘I bid her then...’) is again in the feet. Four of the twentieth century’s most striking voices are represented in the final works on this disc. Vierne, Messiaen, Alain and Langlais all studied at the Paris Conserv-atoire (the latter three under Paul Dukas). Vierne and Langlais were both blind, and both dell under the influence of Franck-Vierne through his studies with the older man, Langlais at one remove, through his appointment to the church of St. Clothilde, where Franck had been organist over 50 years previously. Although the name Messiaen is likely to be most enduring, the greatest talent of the four was probably Alain, who was killed in action at the age of 29. 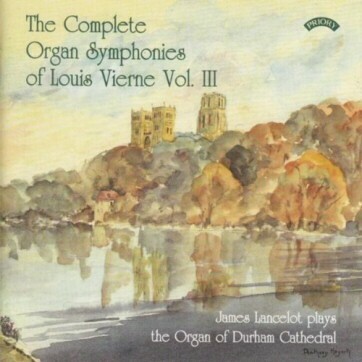 Vierne died in 1937, whilst giving a recital at Notre Dame; Langlais and Messiaen, born in 1907 and 1908 respectively, died in 1991 and 1992. Vierne’s Légende comes from his 24 Pieces en style libre, a collection of pieces in all the chromatic keys, intended for performance on the organ or harmonium. The piece is in F sharp major, and in a gentle compound time, and displays the Vierne hallmarks, including semitonal side-slips and a harmonic palette dominated by diminished chords. The Messiaen piece is a tonepoem: a vision of the eternal Church, massive and rock-like. Messiaen wrote the ‘The Church comes into sight and recedes. The pedals mark the hammer-blows of the Grace that builds the divine edifice.’ Alain’s Choral Dorien is one half of a pair of Chorals which are small-scale pieces, not to be confused with the Chorals of Franck. Alain was not thicnking of the Church modes when when he gave the piece its title, but the Greek modes: the piece tends towards E minor, rather than the D minor we feel we might expect. Langlais’ Incantation pour un jour Saint is a massive, sectional toccata, based on the plainsong for Easter Eve, sung as the new light is brought into the church: ‘The light of Christ’, sings the priest; ‘Thanks be to God’, reply the people. Charles Villiers Stanford was born in Dublin, of a family of lawyers and highly skilled amateur musicians, in 1852. His musical talent was noticed very early, and short compositions were being performed locally before he was ten. This Dublin background was of the greatest importance to him and to his music, not only in such obvious places as the Irish Rhapsodies and the opera Shamus O’Brien, but also in his church music. His autobiography, Pages from an Unwritten Diary, contains a vivid account of the highly colourful church-music scene of his childhood, when one organist (the highly talented Robert Stewart, who would accompany whole oratorios from memory and play the overture to A Midsummer Night’s Dream as an organ piece) and one choir sang in three different churches (Trinity College Chapel and St Patrick’s and Christ Church cathedrals). The Sunday service at St Patrick’s at thee was so blatantly a musical occasion, rather than a strictly religious one, that it was called ‘Paddy’s Opera’; the congregation would leave after the anthem, having already left their seats to stand closer to the choir. Stanford records his disapproval of this, as would have been expected at the time he wrote (1914); but his affection for this kind of semi-operatic experience is quite clear throughout this part of the autobiography. Stanford’s service music, in one way, rejects excessive glorification of the singers, the texts are set without excessive elaboration or repetition of the words, and its clear that he wanted this to be liturgical music, tailor-made for the requirements of the Church of England service as it stood at the time. The fact that two of the services he wrote for, Matins and the Prayer Book Communion, are all but dead letters liturgically, is a matter of historical irony, of course. However, it is perhaps for his service music’s non-liturgical character that it will be remembered. For he was the first major modern composer to introduce what Frederick Hudson calls a ‘symphonic-cyclic treatment’ in setting the words of the church canticles and Communion service; both of the full services recorder here show Stanford’s desire to make the whole day’s liturgical music a thematic and musical unity. This is achieved both by melodic and motivic echoing and also by structural means, such as by using similar keys and modulations throughout the setting. Some of this is due to Stanford’s style generally, of course; both services have extended episodes in the flat mediant major (D flat in the B flat service. E flat in the C), and the use of this key-relation is common to much of Stanford’s music. However, the extensive use in parts of the B flat service of the supertonic C major and in the C service of the submediant A major and minor and the flat submediant (A flat) major gives each set of movements a more individual character. This treatment was, basically, new when the B flat service appeared in 1879, and must have been very exciting at the time; earlier full services, even highly-regarded ones such as Wesley’s E major setting, were not constructed so as to link all movements in this obvious way. The ‘symphonic’ treatment is also apparent in service settings by Stanford’s own pupils, such as George Dyson’s morning and evening service in D. And in Stanford’s case, this secular influence of the concert-hall (which is even more pronounced in the orchestral version of the B flat service) was further enriched by the influence of the opera house. He was an admirer of Wagner as well as of Brahms, and wrote more operas than symphonies; Vaughan Williams once suggested that an Italian or German Stanford ‘would have been celebrated in every opera house in his country’, and his operas thoroughly deserve to be performed again; but for now it is interesting, in the light of his half-admitted admiration for the mid-nineteenth century services at St Patrick;s (which would currently be thought extremely outrageous) that there is a certain operatic touch to the music recorded here, in the sense that this is highly dramatic music; and whatever else the atmosphere in St Patrick’s was, it certainly must have had this quality of drama. The Service in B flat, opus 10, is an early work, but the first seven bars heard on this recording - a fanfare for the organ - were added for the Coronation of Edward VII in 1902. The first phrase, setting the words ‘We praise Thee, O God’, is basically a commonly-used Gregorian intonation for the Te Deum; it forms a motif which is used throughout the movement. Within the first few pages there are already elements which will be picked up later in the day’s music; the cries of ‘Holy, holy, holy’ are recalled at ‘And I look for the resurrection of the dead’ in the Creed, and the move into E flat major at ‘The glorious company’ is recalled in the Magnificat at ‘And His mercy is on them’. After this E flat episode, the music begins to move into more remote keys: first G flat (‘The holy church’) and then D flat (‘Thou art the King of glory’), which introduces a ‘fanfare’ motif. After a short episode in the minor (which is quite unusual in this fundamentally major service) the fanfare returns to usher in a section for solo quartet (‘We therefore pray thee’) in the even more remote key of A major. A fairly short link leads to a recapitulation of the opening music (‘Day by day we magnify Thee’). The other two movements in the morning services are alternatives; liturgically one would not hear all three movements together. The Jubilate uses he ‘fanfare’ motif from the Te Deum (first heard after ‘not we ourselves’), but is mainly based on a new motif, also like a fanfare, which is announced in the opening phrase (‘O be joyful in th e Lord, all ye lands’). (The orchestral version uses a good deal of brass for these ‘fanfare’ sections.) This movement has a Gloria Patri, a rather neutral kind of movement directed to be sung ‘with dignity’; it is repeated after the Benedictus and Nunc Dimittis. It ends with the ‘Dresden Amen’, which is a recurring feature of the whole service. The Benedictus is also based on a melody which is announced in the opening phrase, and heard again at ‘To perform the mercy’ in the alto part, with descant for two treble parts. At ‘And thou, Child’ the music moves abruptly into D flat major and again into a fanfare style. After this the modulations become quite remote (C flat major at ‘Through the tender mercy’, for example), but quite quickly, the security of the home key is reached at ‘and to guide our feet in to the way of peace’ (matching the security of the words). The communion service, like that in C, opens with a movement called ‘Kyrie’ which is fact not the Kyrie eleison of the Catholic Mass but the responses to the reading of the Commandments at the beginning of the English rite. On this recording the Summary of the Law is chanted and the responses to the tenth commandment used (echoing the phrase ‘from generation to generation’ in the Jubilate). (There are also brief responses to the Gospel and for the Sursum Corda, as well as a final Amen, in both services, but these are the only pieces of music not recorded here). The Creed is based on another Gregorian intonation, actually intoned by a bass voice before the movement begins. It often moves between B flat and C major (which is first heard at ‘and in one Lord Jesus Christ’), rather than the D flat major of other movements, but there are also many resemblances to moments in the Te Deum: the key-change at ‘and was incarnate’ (like ‘The holy church’) and the use of the ‘fanfare motif’ from ‘And He shall come again with glory’ onwards. After a final pianissimo move to C major for ‘the life of the world to come’, the more familiar territory (tonally and metaphorically) of B flat is reached for another ‘Dresden Amen’. Of the nest three short movements, only the Sanctus is an original part of the service. The Benedictus qui venit and Agnus Dei, though part of the Catholic Mass, are not in the Book of Common Prayer and are not usually set in full services until the latter part of the nineteenth century (and then only rarely). Wesley’s earlier, in-fluential service in E, for example, omits them. Here the Sanctus is clearly part of the 1879 setting, with its Dresden Amen, but the other two movements, with their very high bass parts which are almost always independent of the ‘real’ bass part in the organ pedals, are characteristic of Stanford’s later style and date from 1910. The settings of these movements in F can also be used for the B flat service, and those who can program their CD players could try this option. The final movement of the Communion service (following the English rite) is the Gloria in excelsis, also based on a Gregorian intonation which is heard in the first phrase. The ‘fanfare motif’ returns at ‘We praise Thee’, but the music soon moves into a slow &frac34; section in G minor, the only extended use of a minor key in the whole setting (‘O Lord, the only-begotten Son’). The final section is a recapitulation of the first, recalling the Kyrie (and Jubilate) at ‘in the glory of the Father’. The evening service was well known already by the end of the nineteenth century, and is now probably the best-known setting of these words - a remarkable achieve-ment for music written in a style which has been unpopular for so long in critical circles (though popularity is itself often the cause of unpopularity in critical circles). Though the patterns of modulation link it clearly to the rest of the Service the Magnificat uses basically new melodies and repeats it opening music for the Gloria Patri, rather then the one used for the other movements. The Nunc Dimittis, however does use the ‘standard Gloria Patri; it is scored for tenors and basses only, a frequent feature of Victorian and Edwardian services (compare, for example, Noble’s Nunc Dimittis in A minor and the greater part of Dyson’s Jubilate in D). The service in C, opus 115, is a much later work. The movements are even more obviously thematically linked than those in the B flat service, with two motifs in particular dominating the whole day’s music. The first, a simple rising-and-falling melody, is heard in the first three bars of the Te Deum (‘We praise Thee, O God’) and is immediately developed at some length. Some tonal centres which are prominent in the rest of the Service are also introduced: A minor at ‘To Thee all angels cry aloud’ and, in a march-style episode, E flat major (‘The glorious company of the apostles’). At ‘Thou art the King of glory’ the music changes to an A minor tonality again and into &frac34; time, and the organ part accompanying ‘When Thou tookest upon Thee’ begins to use the other main motif of the service. This motif is heard more obviously in the organ (now in A major) at ‘Thou sittest at the right hand of God’. A short linking passage leads into a new melody in E flat for trebles (‘We therefore pray Thee’), though the first motif is still to be heard in the organ part. This episode speeds up, then slows dramatically ( a dramatic sense is rarely absent). Modulating into remote keys and becoming very quiet, before reaching C major and the original speed again for a triumphant conclusion. The Jubilate is based on the second main motif (in &frac34; time) throughout, developing it around C major and (at ‘ O go your way into His gates’) A flat major, another main tonal centre of this service. The Gloria Patri is used for all movements which require it, and is fanfare-like to begin with but dominated by the first (rising-and-falling) motif by the final ‘Amen’. The Benedictus is mainly based on its opening phrase (which is rather like an inverted version of the end of the Nunc Dimittis), in &frac34; time, but at ‘And Thou, Child’ moves into E flat and 4/4 time for perhaps the most attractive melody of either service, sung by trebles with accompanying lower voices. A rather operatic linking passage describing the ‘way of peace’, after which the Gloria Patri is repeated. The Communion follows the pattern of the B flat service. In the Kyrie the words ‘we beseech Thee’ are set to a motif which forms the basis of the Magnificat later. The Creed open confidently in 4/4 time, moving towards slower &frac34; section based on the main theme of the Benedictus (‘And was incarnate’). The music of ‘And was crucified’ is similar to that in the B flat service, and equally the creation of Stanford the opera-tic composer; indeed, this Creed is one of the most operatic movements in the recording, with its final section building through dramatic sequences in very remote keys to a sudden resolution in ‘the life of the world to come’. Equally dramatic is the A minor opening of the Sanctus, its blaze of glory at ‘Glory be to Thee’, and the passionate ‘Amen’ based (like the other ‘Amens’ in the service) on the first main motif. The Benedictus qui venit and Agnus Dei in F, designed for possible use with the services in B flat and A as well as that in C, nevertheless fit the C service particularly well by having been composed in the same year (1909). As is often the case in later Stanford, the bass part is high, almost like a baritone; it is surely relevant that Stanford was writing his great orchestral songs for the Irish baritone Harry Plunkett Greene at this period (Songs of the Sea, 1904, and Songs of the Fleet, 1910). The Glora in excelsis which follows is, however, fully part of the service, with many instances of the second main motif; like the B flat service, there is a minor episode for the section ‘O Lord, the only-begotten Son’. The music for Evensong is almost as well-known as that in the B flat service. The motif heard at the end of the Kyrie is very prominent in the Magnificat, first heard at ‘For He hath regarded’. As in the rest of the service, E flat major and related keys are also well-used. The Nunc Dimittis uses the second main motif of the service (in the organ part after ‘according to Thy word’, and ends with a recollection of the opening melody in the Benedictus. Both evening movements use the same as Gloria Patri as is used throughout. 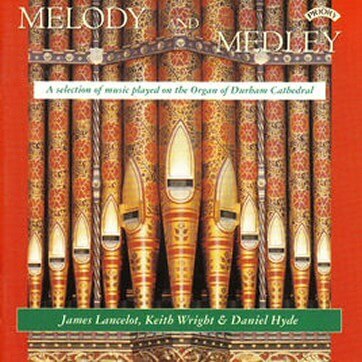 This book on the history of the various Durham Cathedral Organs was first published in 1991 but has been unavailable for some time. We are pleased to announce that it is now again available in a revised and reprinted edition. The book is on sale in the Cathedral shop for £8.99 or by post from the Chapter Office, The College, Durham DH1 3EH (cheques to DCCA for £10.49 inc p&p). Only £5 when bought with any DVD. The book of Psalms is a collection of 150 Hebrew poems which were sung as part of the regular worship of the Temple at Jerusalem. Formerly attributed to King David, they are now known to be the work of various writers over many centuries. Such a collection, while it could easily be the source if much interest, could nevertheless be no more than a historical document. Yet the Book of Psalms is much, much more than that. It survives to this day in the worship of the Jewish Church, and it has always formed an intrinsic and considerable part of the formalised worship of the Christian Church. The seventh-century Rule of St Benedict provides for the whole of the Psalter to be read each week during the course of the daily Offices: the English Prayer Book of 1549 and 1662 provide for its entire recitation each month during Morning and Evening Prayer. It is clear that Jesus was familiar with its contents, as indeed he was with the whole body of Jewish Scripture: and today, two thousand years later, the psalms are as deeply embedded as ever, albeit in many different translations, in Christian worship. Unusually, it is not the translation in the Authorized Version of 1611 that is familiar to English-speaking peoples (indeed, it is rare to hear the psalms read in that version), but the incomparable translation of Miles Coverdale, who translated the whole of the Bible in the sixteenth century - not from original sources, but from a variety of Greek and Latin versions. His translation of the psalms was the one incorporated in the Prayer Books if 1549 and 1662, and it remains probably the best-loved and best-known version, even if not perhaps any longer the most widely-used. While it can be faulted on grounds of strict accuracy, it remains true to the spirit of the original poetry in its own sense of poetry, its most wonderful command of language, and in its retention of the Hebrew device of parallelism, whereby the second half of each verse either reiterates the meaning of the first, or expands it, or contrasts with it (every verse is in two halves, separated by a colon). Such psalms as the twenty-third, or the opening of the twenty-second, have gone deep into our cultural thought by virtue of their context and meaning - as well as by their utterance at the lips of Christ and their fulfilment in his life. One could quote numerous further instances (in fact the Oxford Dictionary of Quotations cites a large proportion of the entire psalter). Hardly less remarkable is the number of phrases which have seeped into our common language quite outside their original context. Rod of iron, clean forgotten, pain and grief, the twinkling of an eye, threescore years and ten - these are just a few examples, no less than three of John Buchan’s works take their titles from the psalms: The Moon Endureth, The Runagates Club (runagates, a corruption of renegades, appears in Psalm 68) and Streams of Waters in the South (Psalm 126, in a Scottish metrical version). This is not just the whim of an individual writer: it was generally assumes that readers would recognise such allusions. Present-day writers cannot assume such widespread knowledge of he Prayer Book: such a title as Devices and Desires no longer strikes a universal chord of recognition! What is the secret of the Psalter's popularity, its continued use and relevance, and its special place in our affections? It is, surely, that the psalms cover the whole range of human feelings and emotions: praise, joy, trust, hope and love: but also contrition, sorrow, fear, despair and - there is no denying it - hate and revenge. In their refusal to duck issues or try to shelter from the dark side of human nature, these ancient poets have struck echoes in the hearts of worshippers down the centuries. And the emotions certainly run deep: “Blessed shall he be that taketh thy children: and throweth them against the stones” (Ps. 137 v.9, speaking of the exile in Babylon) is only one twist in a fairly constant thread of malevolence towards the heathen. And if Psalm 23 is the quintessential expression of total trust, Psalm 88 is perhaps the blackest expression of utter and unrelieved despair ever penned by mortal man. Yet, even if there is a general confidence that God’s judgement will mean the overthrow of one’s own particular enemies, and even if the periodic con-version of the heathen is very occasional and even more brief (normally just ne verse - Ps. 78 v. 35 and Ps. 106 v. 12, for example! ), there are also nevertheless rare glimpses of a vision in which God’s rule extends to all peoples (Ps. 82 v. 8), and indeed visions of a life beyond this of a quality not often encountered in the Old Testament (Ps. 16, vv. 10 - 12). It is because of this complete portrayal of our human condition, not in spite of it, that the psalms form such an essential and living part of Christian worship. The enrichment they have brought to that worship cannot be overestimated. Right from he outset, the psalms have been seen in a musical context: it is no coincidence that the word “psalter” means both the collection of the psalms and (as a corruption of “psaltery”) a plucked string instrument. The quantity of psalmody to be sung in the daily liturgy has always necessitated the use of some form of musical setting which covers the ground fairly rapidly (though this has never ruled out the composition of more elaborate settings of individual psalms for special occasions); and it was also necessary to devise some structure which accommodated the different length of each verse. In Christian times, plainchant became the accepted form early on, and it remains a valid and moving liturgical form, eloquent in its interaction with architectural space and expressive in its musical understatement. It was but a short step from the plainsong tones to the slightly more rigid Anglican chant we know now: in fact of course an Anglican chant in its simplest form is little more than a harmonised version of the plainsong tones. But although isolated chants appeared in print at the end of the 16th century, it was not until 1750 that the first printed collection of chants appeared; 1808, that a printed collection first allocated specific chants to specific psalms - thereby exploiting particular expressive effects, and 1837, no less, that an edition first specified how the word were to be fitted, or “pointed”, to the music. It is evident that until about this time the pointing of psalms was all too often a free-for-all, individual singers going their own ways, even in choirs which should have known better. Choice of chants for particular psalms has continued to be a rather personal matter, many foundations still using their own collections. The Victorian era saw prolific composition of chants: Elgar, in a characteristic moment of self-doubt, once opined that he would be remembered only for a single chant. (But a good single chant is harder to write than one would imagine! It is a measure of Elgar’s genius that in the course of just seven bars he succeeded in imprinting his characteristic stamp on one). Modern composers have continued to rise to the challenge, often with fine results, as this recording illustrates. The chants on this record inevitably reflect something of the “worship of Durham”. That to Psalm 123 is by Arnold Culley, Precentor and Organist from 1907 to 1932: that to Psalm 111 was composed for the Enthronement of Bishop David Jenkins by Richard Lloyd,Organist from 1974 to 1985: and that to Psalm 66 was composed during a sleepless night in Durham Castle by Lindsay Gray, Choral Scholar, exploring the musical potential of the Westminster chimes of the cathedral clock which was keeping him awake! As well as straightforward single chants (repeated every verse) and double chants (repeated every two verses), other possibilities are illustrated. Barnaby’s chant to Psalm 24 alternates between unison and harmony, and between treble and bass tessituras. Nicholson’s to Psalm 101 keeps the four quarters of the chant equal (it is normal for the second and fourth to be longer the the first and third). A descant is added at climatic moments to the chant to Psalm 46 (itself an adaptation by an unknown hand of Martin Luther’s chorale tune to his German paraphrase of this psalm, Ein’ feste Burg). Lastly, a triple chant is used for Psalm 146, reflecting the structure of the psalm, which falls into sections of three verses each. Most of the psalms are enriched, supported and transported by the addition of organ accompaniment: two are left unaccompanied, and here again an understated eloquence is achieved by the absence of the organ. As is customary, the two sides of the choir, Decani and Cantoris, are heard in antiphony: here singing whole verses each, though it is also common for choirs to split each verse between the two sides. Every psalm is followed by the refrain Gloria Patri, sung after psalms since the fourth century. As previously mentioned, there is bound to be a personal element in the choice of chants. Any shortcomings in this area on this recording must be my own; but I must also acknowledge a debit of inspiration to others, chiefly Richard Lloyd, Sir David Willcocks, Roger Lowman and Martin Neary. This recording seeks to encapsulate in relatively permanent manner something of the form and feeling of the daily worship offered in Durham Cathedral. Because worship, however carefully planned and rehearsed, is spontaneous and offered largely by clergy and choir in the presence of and on behalf of a congregation, a recording made on two separate occasions in an otherwise empty cathedral will inevitably lose some of the atmosphere of an actual service. On the other hand it can also be shared by very many who may never have a chance to visit the cathedral itself. At Durham, as at other ancient English cathedrals, there is a tradition of daily choral worship which stretches back for centuries, broken only at the time of the Common-wealth. When the cathedral was a Benedictine monastery, the daily offices would have been sung by the monks in choir, joined for many of the services by the Choristers, or singing-boys. After the dissolution of the monastery the choir, now composed of Choristers and Lay Clerks, continued to sing Matins and Evensong daily. Matins,as also Holy Communion, is still sung on Sundays: but (Again, as elsewhere) it is Evensong which is still sung every day; and, speaking generally, it is in Even-song that English Cathedral music is tended to find its most inspired and characteristic expression. So this recoding seeks to capture something of the atmosphere of the daily worship offered at Evensong. More than that, it attempts to represent Evensong as it might be sung on a special day, namely the feast of Saint Cuthbert on 20 March. Born in 634 in the Scottish Borders, Cuthbert became a monk in Melrose in 651. After a period as Guest Master at Ripon and a return to Melrose as Prior, he became Prior of Lindisfarne (now also known as Holy Island). He was consecrated Bishop of Lindisfarne in 685, and died in his retreat on Fame Island on 20 March 687. A man of intense prayer, beloved of all with whom he came into contact, and to whom numerous miracles have been attributed, he is the most famous saint of the north-east. In 857 Danish raiders destroyed the monastery at Lindisfarne, forcing the monks to flee and to take with them the body of St Cuthbert. It was not until over a century later, in 995, that the saint’s remains reached their final resting place, on a hill almost entirely surrounded by the River Wear. Here, to enclose his shrine, a cathedral was built, being pulled down in 1092 to make way for the present one which was started the following year. If it had not been for St. Cuthbert, Durham Cathedral would never have existed. The Office of Evensong reached the form in which it is heard here in 1662, where it forms part of the Book of Common Prayer. Much of the material in the service goes back a further century, to the time of Miles Coverdale (the translator of the psalms) and Thomas Cranmer. The readings are from the twentieth-century Revised Standard Version of the Bible: the prayers include material by the seventeenth-century metaphysical poet John Donne and by the compilers of the Alternative Service Book of 1980. But, despite the varied provenance of the words, the formality of the language and the rounded cadences of the psalms in particular will strike some as old-fashioned. It is not only a tribute to the quality of the words but also a sign of encouragement and hope that composers of all periods, including those of the present day, have felt inspired to set them to music which is of its own time. In this recording, words written centuries ago are heard set to music written (mostly) during our own lifetimes. And so the tradition, old though it is, is constantly renewing itself and finding new expression and life. The service opens with a setting by Richard Lloyd (organist of Durham Cathedral until 1985) of a poem by George Herbert. The setting of the Canticles is by Kenneth Leighton, whose untimely death in 1988 robbed Britain of one her finest composers. The anthem, commissioned by the Dean and Chapter of Durham for the 1300th anniversary of the death of St Cuthbert, reflects the influence on John Tavener of the Orthodox tradition. As he has written, “this Ikon of St Cuthbert, an ikon of music and words in the place of wood and paint, seeks to recall, in its stylised form, the personal aura of Cuthbert”. The Responses by Francis Grier show something of the same Orthodox influence. The hymn was written by Peter Baelz, then Dean of Durham, for the redadication of the cathedral bells in 1980 (the names in the first and last verse are those given to the cathedral bells). Since then this has been one of the hymns sung at Evensong on St Cuthbert’s Day during the procession to the tomb of St Cuthbert. The organ music which frames the Office looks, as so often, beyond these shores: in this case to Paris, the twentieth-century Paris of Langlais and Mulet. William Byrd published three sets of Latin-texted motets, neatly running of his composing output into three phases. His earliest publication, jointly with Thomas Tallis in 1575, is principally of technical rather than musical interest, and none of these motets is presented in this recording. All of those performed here come from the two books of Cantiones Sacrae (1589/91) and the two books of Gradualia (1605/07). The motets from Cantiones Sacrae tend to be longer, more architectural pieces; although they were not designed for specific occasions, their texts and moods allow them to fit comfortable into a yearly cycle. Gradualia was a working compendium of pieces for all the feasts of the church’s year: its publication was an act of political subversion; its dedications - to the Earl of Northumberland and Lord Petre - a chance for Byrd to acknowledge the support of his powerful Catholic patrons (John Bossy, in The English catholic Community 1570-1850, London, 1975, refers to such patrons as part of a system of “seigneurial Catholicism” which proved impossible for Queen Elizabeth’s Protestant zealots to eradicate).To publish church music with Latin texts at all during the reigns of Queen Elizabeth I and King James I was a risky business. The Roman Catholic religion was outlawed; prosecution, fines, imprisonment and public executions of Catholics were common. It was a period when “Byrd, his family and his servants were repeatedly convicted of recusancy, when his house and houses of his friends were searched, and when he was associating with Catholic missionaries who risked, and in some cases suffered, death for their beliefs.” (John Harley, William Byrd, Gentleman of the Chapel Royal, Aldershot, 1997, p228). Latin texts were tolerated at Cathedrals and the Chapels Royal (where it was assumed that they would be understood), but they were not encouraged: no-one besides Byrd seems to have written much in Latin after the accession of Queen Elizabeth I. His Cantiones Sacrae could possibly have been intended for court use, but there can be no doubt that Gradualia were destined for private Catholic chapels only. The drama and danger of Byrd’s age seem a world away from the rights-based security of our own but, listened to with discerning ears, Byrd’s music connects us to it (Those interested in a vivid and involving account of Byrd’s times will enjoy the relevant chapters of Simon Schama’s A History of Britain (Vol. 1), London, 2000, pp274-395). Byrd as a man and a musician appeals strongly to us today: he was a subversive, able to survive in a political world (Byrd is perhaps similar to Edward Somerset, 4th Earl of Worcester (Byrd’s friend and the dedicatee of the Cantiones Sacrae of 1589), whom Queen Elizabeth described as having “reconciled what she thought inconsistent, a stiff papist, to a good subject”, Harley, p77); he had firm beliefs and stuck to them. We recognise his genius by rehabilitating his music to its natural home, the cathedrals and greater churches of our land. Use of this music within church services puts back the dimension that can be lacking in the concert hall or recording studio. These motets (the word “motet” is used rather loosely here to mean a Latin-texted sacred piece) present an astonishing variety of forms, textures and colours. In his choice of forms Byrd ranges from the multi-sectional respond, harking back to the votive antiphon of a century earlier (tracks 1, 2, 11 and 14), through the homophonic motet typical of continental contemporaries such as Lassus (tracks 4, 8 and 23), to short liturgical pieces that created a new style of vocal chamber music (e.g. Tracks 5, 7, 15 and 19). Byrd’s use of texture develops through his works, but also depends on the number of voices. In his earlier works his counterpoint was rather rigid, the individual musical ideas being relatively long (examples of this occur in O quam gloriosum, track 22, written before c1582) (Harley, p222; Joseph Kerman, The Masses and Motets of William Byrd, London, 1981, p129). Later he favoured shorter distances between the entries of successive imitative voices and the flexibility to move freely between polyphonic and homophonic writing for rhetorical purposes. Superb examples of this are heard in Civitas sancti tui (track 10) and the well known Ave verum corpus (track 19). The first two tracks on this recording make for an interesting comparison, being written in the same archaic respond form, both for five parts and to similar texts, but twenty years apart. Rorate coeli, the later of the two, is the more trimmed and efficient, making the opening points of each section of Laetentur coeli seem bare and ungainly. Byrd chose his voice-parts carefully. The usual sixteenth-century complement, for those choirs that could afford it, was five parts, with two altos or two tenors. All of the Cantiones Sacrae motets are for five or six parts (Haec dies, track 13, is the only six-part piece recorded here), and most follow this vocal distribution. But two of them feature two treble parts, always a sign of brilliant writing in Byrd: O quam gloriosum and Laudibus in sacntis (track 22 and 23). From the Easter Gradualia Victimae paschali also features two trebles, but for a more obvious pictorial reason: they are the women who visit the tomb early on Easter morning. Four parts for Byrd indicates serious writing, “fluid, half-homophonic rhetoric” (Kerman, p344). It is reserved for texts of special importance, here all connected with the Incarnation and Eucharist (tracks 4-6 and 18-21). We have chosen to perform many of these with reduced forces to bring out their intimacy. Many of Byrd’s pieces are effective either for mixed choir or for men’s voices. Recent research has shown that Byrd’s choice of clefs for some of the Gradualia items indicated the possibility of a lower performing pitch, perhaps using men’s voices to compensate for the scarcity of trained boys’ voices (even the Chapel Royal had problems recruiting boys, and Byrd himself may well have been poached as a treble from Westminster Abbey) (David Skinner, “Catching the Early Byrd: ‘Wyllyam Byrd’ at Westminster”, article for the Cardinalls Musick website, 1998). Six of the tracks on this recording explore theses sonorities (3, 5, 12 and 14-16). On first hearing Byrd’s harmony may seem stylised, indistinguishable from the sixteenth-century norm. Closer examination reveals a wealth of subtlety and nuance. In his use of dissonance, for example, he can be restrained for the sake of clarity and simplicity (the first fourteen bars of Viri Galilei contain not so much as a suspension), he can pile up suspensions for structural effect (for example the climax towards the end of Civita santi tui), or he can use dissonance for colour and emphasis. At the start of Ave verum corpus both harmony and rhythm stress the “truth” of the second word, as if emphasising the Roman Catholic belief in the sacrament as the actual body of Christ. The “transubstantiation of words into notes” (John Irving: “Penetrating the Preface to Gradualia”, Music Review, 1990, p159) illustrates Byrd’s own explanation at the start of Gradulia that to a man thinking about divine things... The most fitting measures come, I know not how, as if by their own free will”.